As a member of our watershed, the Lake Elsinore & San Jacinto Watersheds Authority (LESJWA) invites you to the 2018 LESJWA Water Summit. Our watershed faces unique challenges that require action and agency collaboration to seek solutions for watershed management. 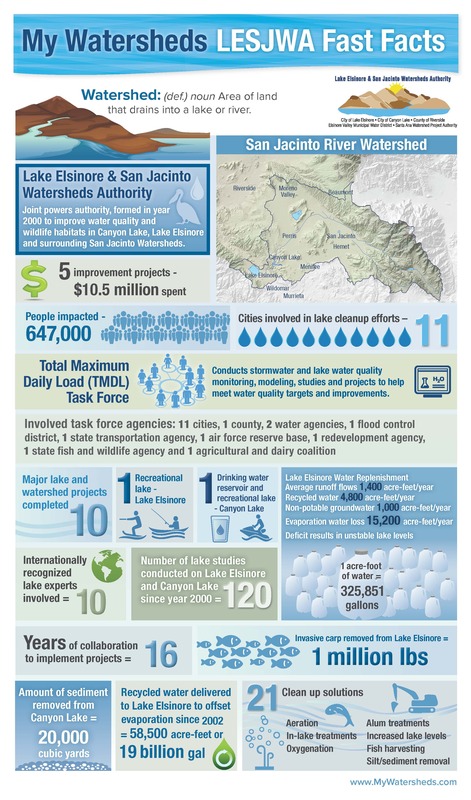 The Lake Elsinore and Canyon Lake Total Maximum Daily Load (TMDL) Task Force is an active partner in improving watershed challenges throughout the San Jacinto Watershed. The Summit will feature information on how the TMDL Task Force has worked with the Santa Ana Regional Water Quality Control Board to implement watershed monitoring, mitigation projects, modeling and a variety of other solutions to meet TMDL targets. This year, the task force will complete critical revisions to the TMDLs. These revisions impact our watershed. Therefore, we highly encourage you and other key representatives from your agency to join us at this event to learn more about these TMDLs and how these revisions may affect our watershed, starting in the San Jacinto Mountains, traveling downstream through Canyon Lake and eventually ending in Lake Elsinore. In addition, you will learn about lake accomplishments and possible future activities; the Lake Elsinore Advanced Pumped Storage (LEAPS) Project, a proposed hydroelectric facility; and future impacts of the TMDL on the watershed. A panel session will be included with representatives from the Santa Ana Regional Water Quality Control Board, Riverside County Flood Control and Water Conservation District and the Western Riverside County Agricultural Coalition who will discuss how agencies are addressing TMDLs and improving their overall impact on water quality. The 2018 Water Summit will take place on Wednesday, April 18 , 20 18 from 9:30 a.m. to 1:30 p.m. (registration is at 9:30 a.m., the event begins at 10 a.m.). The event will be held at Diamond Stadium in the Diamond Club located at 500 Diamond Drive, Lake Elsinore, CA 92530. Registration is $30 and will include lunch. Register online or contact Liselle DeGrave of DeGrave Communications at (951) 764-0865 or email directly at liselle@degravepr.com.